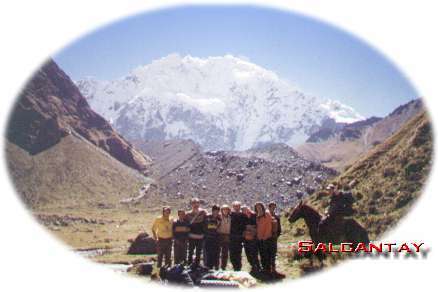 With a height of 6.271 m, the Salcantay is the second highest mountain in the region. The few people living in the Andes still adore the highest summits as gods, called Apus. Every Apu lives in a mountain and has a certain caracter and speciality. When de Andes people call the Apus, they represent themselves as condors. Works are carried out in complete dark room, because the Apus don't like to be seen by humans. People ask them questions about their problems or diseases and the Apus help them by giving advice. Apu Ausengate is known as a gentle wise female spirit. Her compasion to humans created a myth. No one dares to live around this mountain. Locals say that the souls of bad people fly around her summit looking for rest. They can be seen as shadows passing above the snow line. They say that if a person dies by accident, it is the work of a bad spirit. A shaman in Cusco prepared a 'pago' to the 'Pachamama' or an offer to the Mother Earth. Offers have to be burned and consist out of Andivian cereals, flowers, coca leaves, pieces of cloth and personal things. We collected dried excrements to make a fire and offered the pago to the Apus. Everybody offered its prayer and sent good energy to family and friends, to the current trail and for good weather. 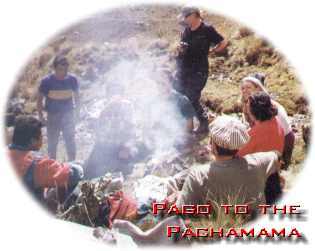 We drunk ca�aso after offering the first sip to the Pachamama. All left the place so the Apus can 'eat' our offer. 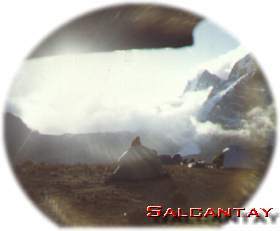 A neighbour of the Salcantay answered us with an avalanche. This was a good sign. Later Zenon prepared us a nutritious meal. We left the place with a peaceful heart. After a few mates de coca and a supper of qui�ua soup and brown beans we dived in our sleeping bags, hoping that the pago will protect us against these bad spirits.